Mauri A (2010). Field experiments using CO2 enrichment: a comparison of two main methods. iForest 3: 109-112. The dramatic increase in global atmospheric carbon dioxide over the past century is hypothesized to have significant impacts on the earth system. To understand the effects of elevated CO2 on terrestrial ecosystems, two main methods have been used to simulate an increase of CO2 in a semi-controlled field setting: 1) Open Top Chambers (OTC); and 2) Free Air CO2 Enrichment (FACE). The OTC method has been applied to study the components of forest ecosystems at small scale by manipulating seedlings or isolated juvenile trees, but is not able to address ecosystem processes as a whole. For technical reasons, OTC cannot be used to consider scaling issues, interaction with the boundary layer, and competition among species. To address these issues FACE technology was developed. FACE enables longer-term studies in larger plots, and allows studies of plant processes such as leaf area and canopy development, canopy energy balance and canopy gas exchange. In this review, I synthesize results from literature, in particular from meta-analysis techniques applied either to OTC or FACE. The results are qualitatively similar: CO2 enrichment leads to reduced stomatal conductance and leaf nitrogen, and enhanced photosynthesis and production. However, photosynthesis and crop yield were lower in FACE experiments than OTC, while starch content was higher. These results provide support for ecosystem model simulations, and help fill the gap between individual plants, forest and regional ecosystem. Neither OTC nor FACE can provide a clear indication of the regional-scale feedbacks between atmosphere and vegetation that might be expected under elevated CO2. To address this issue, further research is needed. What have we learned from 15 years of free air CO2 enrichment (FACE)? A meta-analytic review of the responses of photosynthesis, canopy properties and plant production to rising CO2. New Phytologist 165: 351-372. Available technologies for field experimentation with elevated CO2 in global change research. In: “SCOPE 45 Ecosystem Experiments”, Chapter 15 (Mooney HA, Medina E, Schindler D, Schulze ED, Walker BH eds). Wiley, UK, pp. 296. Effects of source-sink relations on photosynthetic acclimation to CO2. Plant, Cell and Environment 14: 869-875. A meta-analysis of elevated CO2 effects on woody plant mass, form, and physiology. Oecologia 113: 299-313. More efficient plants: a consequence of increased atmospheric CO2? Annual Review of Plant Physiology and Plant Molecular Biology 48: 609-639. FACE technology: Past, Present, and Future. In: “Managed Ecosystems and CO2” (Nösberger J, Long SP, Norby RJ, Stitt M, Hendrey GR, Blum M eds). Springer, Berlin, Heidelberg, New York, pp 15-43. Fourth Assessment Report. Chapter 10. Global climate projections. 10.7 Long Term Climate Change and Commitment 10.7.1, Climate Change Commitment to Year 2300. Based on AOGCM, pp. 822. Fourth Assessment Report. Summary for Policymakers. Impacts of elevated atmospheric CO2 on forest trees and forest ecosystems: knowledge gaps. Environmental International. 29: 161-169. Biosphere responses to CO2 enrichment. Ecological Applications 10 (6): 1590-1619. In situ stomatal responses to long term CO2 enrichment in calcareous grassland plants. Acta Oecologica 18: 221-229. Open top chambers for exposing plant canopies to elevated CO2, concentration and for measuring net gas exchange. Vegetatio 104/105: 3-15. Screen-aided CO2 control (SACC): middle ground between FACE and open-top chambers. Acta Ecologica 18 (3): 207-219. 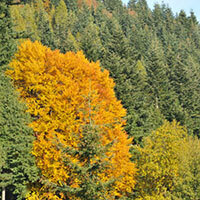 Forestry carbon dioxide projects to close down. Nature 456 (7220): 289. The effects of tree maturity on some responses to elevated CO2 in Sitka Spruce (Picea sitchensis Bong. Carr.). In: “Carbon Dioxide and Terrestrial Ecosystems” (Koch GW, Mooney HA eds). Academic Press Inc., S. Diego, CA, USA, pp 53-70. Rising atmospheric carbon dioxide; plants FACE the future. Annual Review Plant Biology 55:591-628. Soil moisture dynamics of calcareous grassland under elevated CO2. Oecologia 117: 177-186. Use of NOAA/ESRL data (Conway T ed). Earth System Research Laboratory, National Oceanic and Atmospheric Administration, US. Department of Commerce, Boulder, Colorado, USA. Tree responses to rising CO2 in field experiments: implications for the future forest. Plant, Cell and Environment 22: 683-714. CO2 enrichment of a deciduous forest: the Oak Ridge FACE experiment. In: “Managed ecosystems and CO2: case studies, processes, and perspectives” (Nösberger J, Long SP, Norby RJ, Stitt M, Hendrey GR, Blum H eds). Ecological Studies, Springer, Berlin, vol. 187, pp. 231-251. A U.S. carbon cycle science plan: a report of the carbon and climate working group. U.S.Global Change Research Program, Washington, DC, USA, pp. 69. The study of ecosystems in the context of global change. The terrestrial biosphere and global change. International geosphere-biosphere programme book series 4, pp 27. Carbon dioxide enrichment technologies for crop response studies. Journal of Scientific and Industrial Research 65 (11): 859-866.